Carnival season spans the whole city of New Orleans, and even other areas within the south like Mobile, Alabama (home of the very first American Mardi Gras in 1703) and along the Mississippi Gulf Coast. 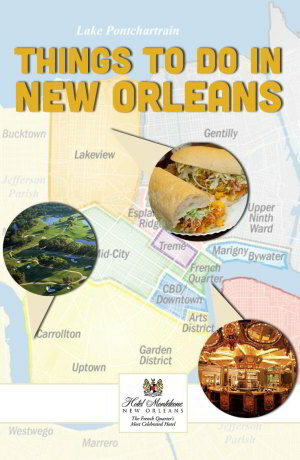 However, you won’t need to travel far and wide to experience an authentic Mardi Gras. In fact, you don’t even need to leave our hotel! Check out five ways to experience Mardi Gras at our historic French Quarter hotel. 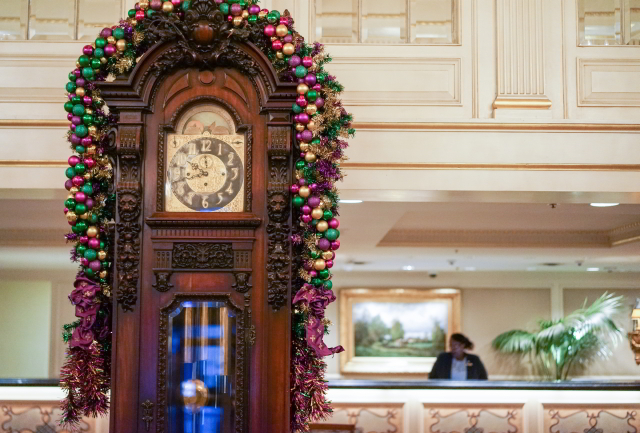 As you arrive to Hotel Monteleone for Mardi Gras, you’ll be greeted by festive decorations. 1. Stay in a Literary Author Suite. Our hotel features five suites honoring Ernest Hemingway, Eudora Welty, William Faulkner, Tennessee Williams, and Truman Capote, all of whom had a personal connection to Hotel Monteleone. Although Capote, who was born in New Orleans, got lost during Mardi Gras as a child, he still couldn’t shake the call of the Crescent City. “I get seized by a mood, and I go,” he said in a People Magazine interview shortly before his death. 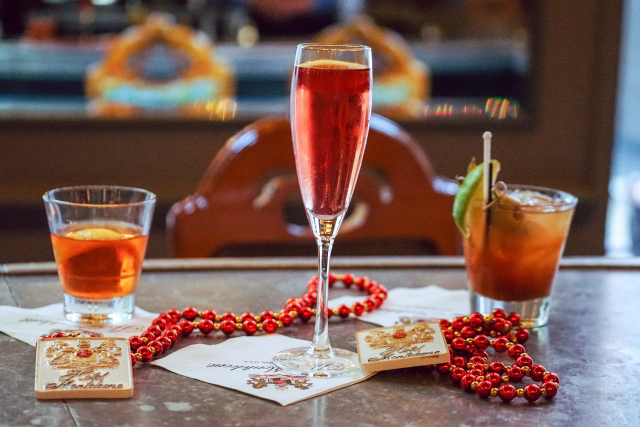 Sip a traditional New Orleans cocktail while you listen to live music at the Carousel Bar. Our bar’s signature cocktail, the Vieux Carre, is the perfect homage to the French Quarter: a blend of Bulleit Rye Whiskey, Hennessy, sweet Vermouth, Benedictine liqueur, and a dash of Peychaud’s bitters. Quick history lesson – Peychaud himself was a New Orleanian who created his bitters in 1830. Speaking of history, bartender Walter Berferon created the Vieux Carre drink at our bar in 1938. That same year, LIFE Magazine sent photographer William Vandivert to photograph Mardi Gras. No doubt some of those participants sipped on our signature cocktail before heading out to watch the parades. When you visit The Carousel Bar on the weekends, you’ll be greeted by live musical performances by some of our favorite local musicians including Robin Barnes, Lena Prima and Nayo Jones. 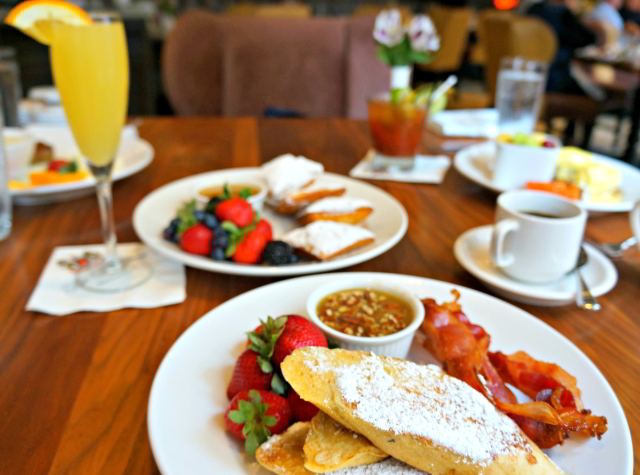 Enjoy the Pain Perdu, Criollo Restaurant’s take on French Toast, when you visit Hotel Monteleone for Mardi Gras.  Whether you had a few too many on Lundi Gras night or simply want to prepare yourself for a long and busy Fat Tuesday, our restaurant Criollo is one of few restaurants open on Mardi Gras day. We can’t think of a better place to load up on decadent favorites like beignets with praline sauce or Eggs Tchoupitoulas on a buttermilk biscuit. The restaurant also has DIY mimosas and a killer Bloody Mary for an extra kick of morning fuel. Trust us, your feet will thank you. Mardi Gras means spending hours standing and walking, and our on-site spa has just the cure. The Aria Ultimate Pedicure includes a revitalizing menthol mask for tired toes plus traditional trimming, filing, massage, and polish. The spa also offers a range of services like the Black and Gold Manicure (a New Orleans favorite), facials, and massages. You’ll find plenty of gifts for your friends back home in the Hotel Monteleone gift shop. You won’t even need to step outside to pick up a few souvenirs for your friends and family back home. 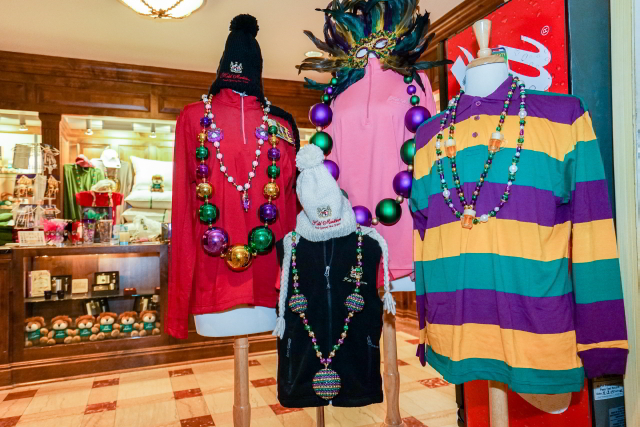 Hotel Monteleone’s on-site gift shop has plenty to explore, and we’re always extra festive this time of year. Book a Room for Mardi Gras! Fat Tuesday is on March 5, 2019, but February is full of parades and Carnival festivities. Book now to enjoy these experiences – and many more – for Mardi Gras at Hotel Monteleone!